The Black Crowes had a seven-year gap between their latest album, Warpaint, released early this year, and Lions, which came out in 2001. 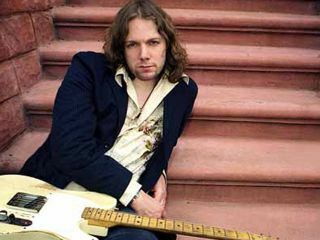 Guitarist Rich Robinson says fans won't have to wait so long for a new disc - it could come as soon as 2009. Robinson tells Billboard that he and older brother and frontman, Chris Robinson, have "tons of songs. Chris and I are always writing." This might come as a surprise, seeing as the Crowes split up in 2002 due to musical disagreements (what else?) and a growing sense of apathy. By 2005, however, the band started to find its way back together, helped along by the Robinson brothers acoustic duo tour, Brothers Of A Feather, which they launched in 2006. "Chris and I had so much fun doing it," says the younger Robinson. He reveals that another Brothers Of A Feather tour and an album of originals is being discussed, but stresses that any material they write won't impinge on The Black Crowes. "I think the context will dictate that pretty easily," he says. For the moment, however, the next Crowes album is the big priority, and Robinson sounds like a man - and artist - reborn. "Having all this sort of new enthusiasm and this newfound sense of identity as a band, I think we want to put it to good use and make another great record and really do some different and interesting things." Having seen the Crowes on tour this year, MusicRadar can truthfully say that the band rocks the house like they did back in the day. That's 'different and interesting' enough for us.